Olivier Raymond, born in 1971 in Grenoble (France), got into “black music” (disco & funk) already in his early teens. During college years, Olivier’s friendship with Stéphane Deschezeaux, kick started a musical journey, with a debut on a local radio station broadcasting a show dedicated to Funk … hence, only being 15 years of age, Olivier had started mixing. Olivier’s mixes were influenced by a large spectrum of music styles: italo-disco, new-wave (Depeche Mode, New Order… ) and the early Chicago and New-York house scene. By 1991, Stephane and Olivier bought their first bits of equipment and started to compose music. Not too long after that, Olivier became a resident dj at a club in Grenoble, jump starting a career in electronic music! It was by 1994, that the experiments of Stephane and Olivier became official. Their live act ‘Oxia’ was born. In 1995, Olivier and Stéphane met Michel Amato (The Hacker), Alex Reynaud and Kiko in Grenoble, the electronic-tuned city of France. 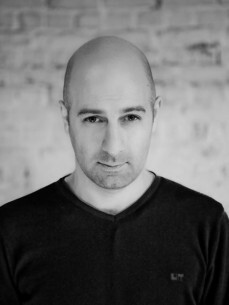 That same year Olivier created Ozone records together with Kiko, where Oxia released the first EP (influenced by the American techno sound à la Jeff Mills, Robert Hood and Damon Wild). On that same stamp, Olivier also co-produced the first releases of Jack de Marseille. Olivier never rested and went on to create a new label with Michel Amato aka The Hacker and Alexandre Reynaud in 1998. They baptized it ‘Goodlife’ in homage to the mythical Inner City track. Olivier and Stéphane still produced several EP’s together and by the end of the century they decided to part paths (as good friends) and Olivier continued with Oxia as solo DJ act. 2011 saw Oxia mixing another b-day compilation. This time he made a selection from the 8Bit cataloque for their 5th anniversary. On this mix you can also find a previous unreleased track of Oxia (‘Meaningful’). Soma wanted to have Oxia on the bill for their 20th anniversary so he contributed his interpretation of the ‘Human’ track by Slam. But most importantly Oxia started working on his forthcoming 2nd solo album. You can expect the new album to hit the stores early 2012.